When Steve Jobs introduced the iPad, he said that it would be on sale at all the Apple retail stores, through the company’s well-known online store and at Best Buy. This immediately leads you to believe it will be the entire chain, but I’m here to tell you, it’s not. Me: Excuse me, where are the iPads? Best Buy Employee (BBE): I’m sorry, we don’t have them. Me: Really? I thought the entire chain was supposed to be carrying them. BBE: (with a big smile) Don’t get me started. Me: Ooookay, thanks for your time. I found this odd for one very large reason: Columbia, MO is the home of the University of Missouri, better known as Mizzou to college sports fans. While there not being any Apple products in the only Best Buy in a town such as one that holds a major state university is odd enough, it is even odder when you consider the University of Missouri School of Journalism is almost exclusively Apple-centric. Back in the fall of 2007, the University of Missouri School of Journalism — which is world renowned — decided that Apple computers were not mandatory, but they were highly recommended for incoming students. 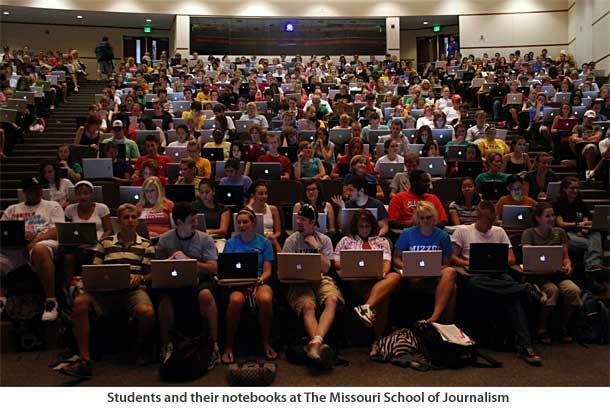 The school even went so far as to release the publicity photo you see below of Journalism students in a classroom with all of their various Mac laptops filling the room. To take this even one step further, Journalism students were told last spring that they would be required to own an iPhone or iPod Touch for the fall 2009 semester as the school planned to deliver information to them via those devices exclusively. While they certainly receive discounts through Apple and the school, you would think with that many Apple products roaming the city, the local Best Buy might want to carry the products. We currently sell Apple products at Apple Shops in 673 of our U.S. stores, and customers from anywhere in the country can purchase Apple products from us online at bestbuy.com/apple. Best Buy store leadership and Apple jointly determine store selection based on customer demand and our (Best Buy, Apple) complementary retail locations. Best Buy has 1,074 stores in the U.S. total. Okay, this still doesn’t make sense to me. This Best Buy is located in a city with a major university, it is the only location between Kansas City and St. Louis along the I-70 corridor, it’s the only one going North for a nearly four hour drive from it into Iowa … how is this store not a prime location for Apple products? While I am shocked by this one store, I am more shocked by only about 60 percent of Best Buy stores having Apple Shops when Steve Jobs is up on stage telling you that you can go to one of these stores and buy the product? Wouldn’t you think you would at least get that one product into ever location? I’ve worked retail, I understand buying decisions, but this one just made no sense to me, and it probably never will.